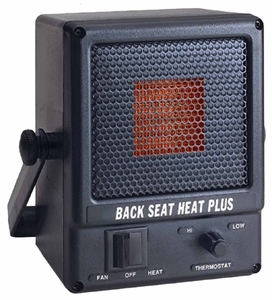 Heat those always cold areas in Autos, RVs, vans, boats, trailers, cabs - virtually any 12 volt or 24 volt vehicle - with this powerful compact heater that heats up instantly; provides over 1100 BTUs of heat for 12 Volts and 2100 BTUs for 24 Volts; features an adjustable thermostat. Comes with all the necessary wiring, installation instructions, optional dash mounted switch and universal mounting bracket. This heater draws 25 amps. If your vehicle's alternator does not pruduce at least 45 amps to 50 amps, there will not be enough power to operate this heater. Do not install. Height: 7 1/4", Width: 5 5/8", Depth: 4 5/8"